Chronomat is derived from CHRONOgraph for MAThematicians and came to life in 1941. It was one of the first watches with a slide-rule (patented by Breitling in 1940) and this watch was delivered to the market in 1942. 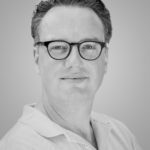 The Breitling Chronomat has a long history, which can be found in this article on WatchUseek and is definitely worth reading if you’re into vintage Breitling Chronomat watches. In our Breitling expert interviews with Fred and Rene about Breitling, you can also find some interesting stories about some early Chronomat models. I am not sure if the person who is interested in the Breitling Chronomat B01 Chronograph 44 that we have on Fratello today is the typical collector who is into reading about vintage watches, but for those who are, check the links above. Let me start by saying that I acknowledge that most watches are worn by people who just like a nice or good watch. The typical watch nerd things we all get so excited about are only appreciated by a small representation of today’s watch consumer. So let’s have a look at this Breitling Chronomat B01 Chronograph 44, where B01 refers to their in-house developed chronograph calibre and 44 to the diameter of the watch. This watch offers a historical link to the Chronomat models of the past but is also a very good candidate for being an everyday watch for those who just want a good watch. The Chronomat models that are there today, have little to do with those very first models from the 1950s-1970s. Those actually show more similarities with the Navitimer watches than with the Chronomat B01 that we have here. 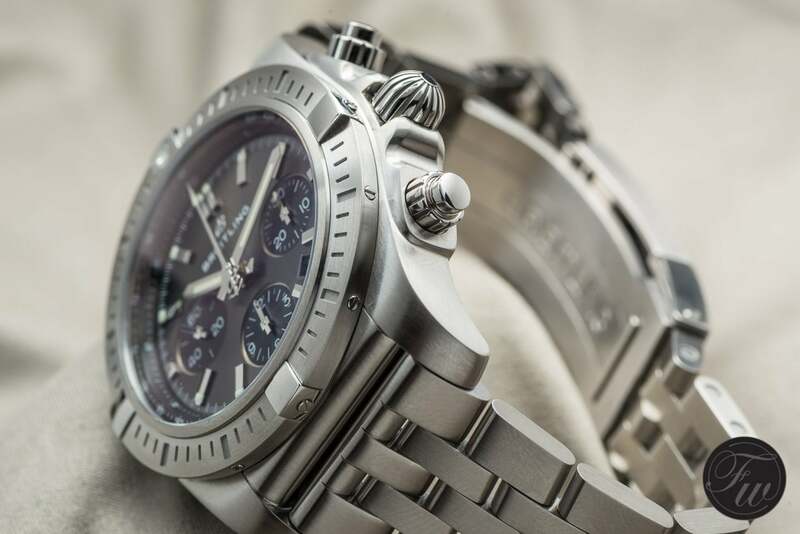 The design of the Breitling Chronomat B01 Chronograph 44 goes back to the 1980s though when the slide-rule bezel made way for a bezel with rider tabs. A 44mm stainless steel case is not considered overly big these days, but in combination with the very solid Pilot bracelet, it is a heavy chunk. I think it is part of the feeling you should have when wearing a tough looking watch, it needs to have a presence on the wrist. Not only aesthetics, but there definitely should be some weight as well. Wearing a huge and tough looking watch, but made of titanium or forged carbon, for example, doesn’t add up in my head when this watch is on the wrist. It doesn’t feel right. You don’t have to worry about that with the Breitling Chronomat B01 Chronograph 44 in stainless steel, the bi-colour probably adds some more weight to the game because of the use of gold. The Breitling Chronomat B01 Chronograph 44 comes in a few variations, material-wise but also for its dial. We have the Blackeye Gray dial, which is an anthracite dial with black sub dials. As you probably already know, Breitling wants you to be able to distinguish a chronograph with a Breitling in-house movement from a third-party calibre by using contrasting colours for the subdials. 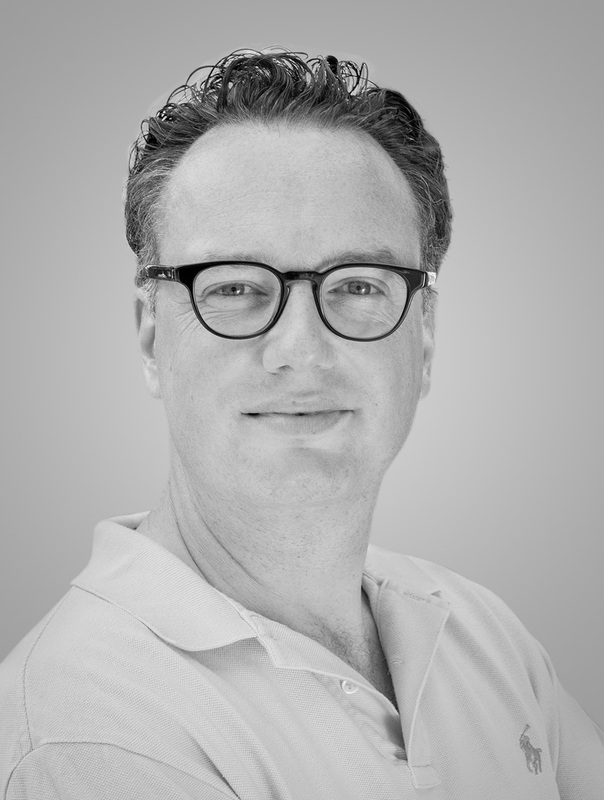 Easy to recognize what you are dealing with, but I assume that once you bought the watch, you know whether it has an in-house powered movement or one that Breitling sourced from a third party (ETA/Valjoux). 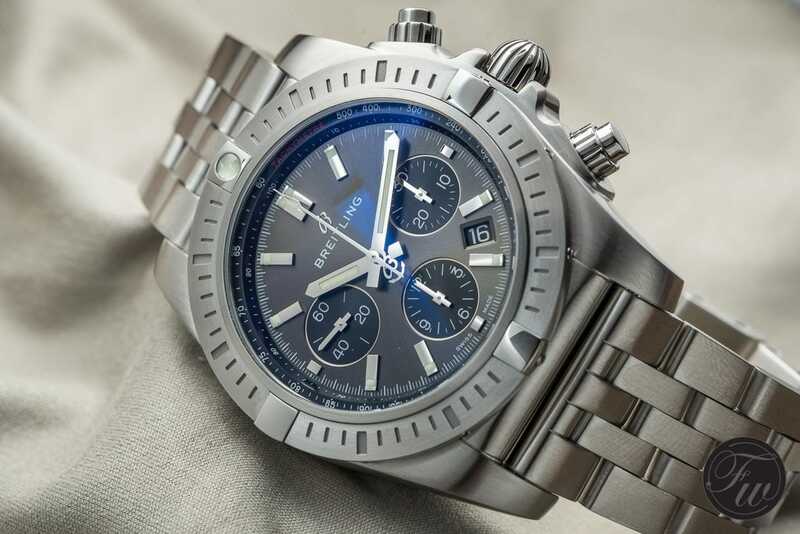 It does help when you are looking for a Breitling watch and want to immediately shift the in-house movements from the Valjoux based movements, just make a quick selection of watches based on the contrasting dials. That said, the Valjoux 7750 based movements that Breitling dubbed B13 calibre, is a solid chronograph movement that has proven itself over the last few decades for sure. 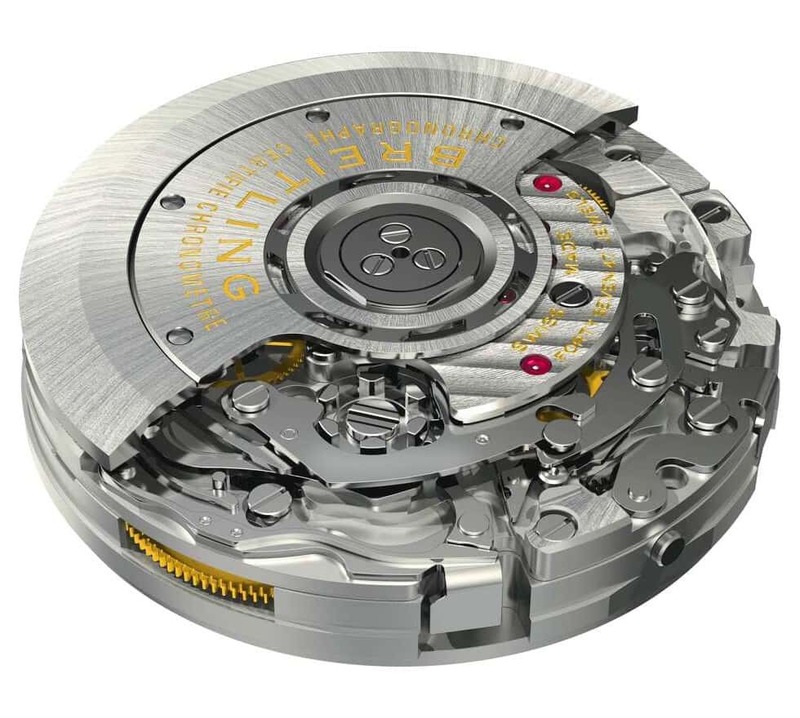 But the B01 is, of course, the in-house developed chronograph movement by Breitling, of which they are so proud. The grey dial with black subdials gives enough contrast to see its different and to me the combination of grey and black is a bit nicer than the other stainless steel version, that has a blue dial with black subdials. Somehow grey and black combination is more attractive to me, but that’s a personal thing of course. When you’re up to it, the bi-colour models in black and gold or blue and gold give a super nice contrast and you can be sure that your watch is noticed by the rest of the restaurant guests on a Saturday evening. I am certainly not disapproving a bit of gold on your watch, I am just warning you that you’ll be in the spotlight for sure. You will find the date window at 4.30 on the dial of this Breitling Chronomat B01 Chronograph and it perfectly blends in with its black disc. The printing of the numerals is in (silvery) white, to have at least a bit of contrast. My eyes get a bit older, so I actually love white date discs with black printing these days, but from a design standpoint I get that this set-up is easier on the eyes. I found the shape of the small hands interesting, as they reminded me of the hands used in the big 1970s (late 1960s) Chronomat watches. A little square shape on the pinion and a sleek shape towards the indexes. 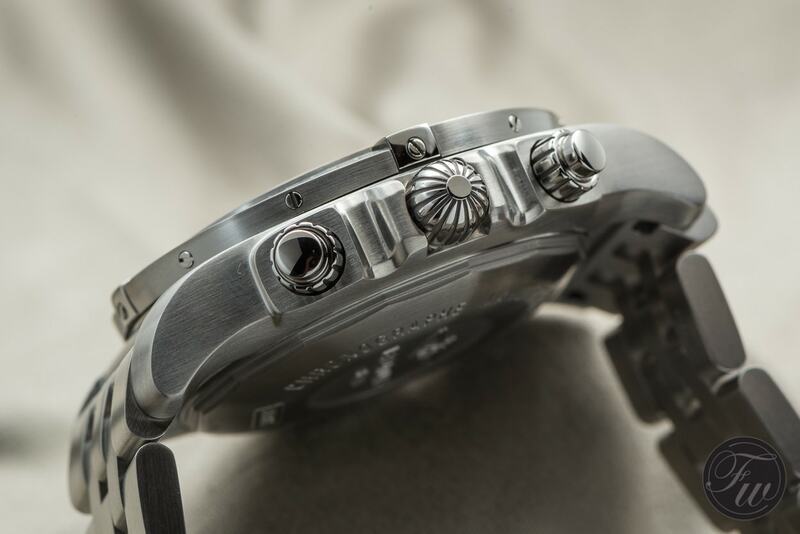 The large central hands are silver and applied with Super-LumiNova. The central second’s hand (for the chronograph) has the famous ‘B’-logo and anchor on the short end. The hour markers are nicely polished and give a good contrast on the grey dial. The tip of the hour markers has been applied with Super-LumiNova as well. Although there’s little colour to discover in this version, the printing of the word ‘Tachymetre’ on the rehaut is in red. You’ll find the typical onion winding (and setting) crown at 3 o’clock and the chronograph pushers next to it. Unfortunately, the B01 movement is not visible via the caseback. 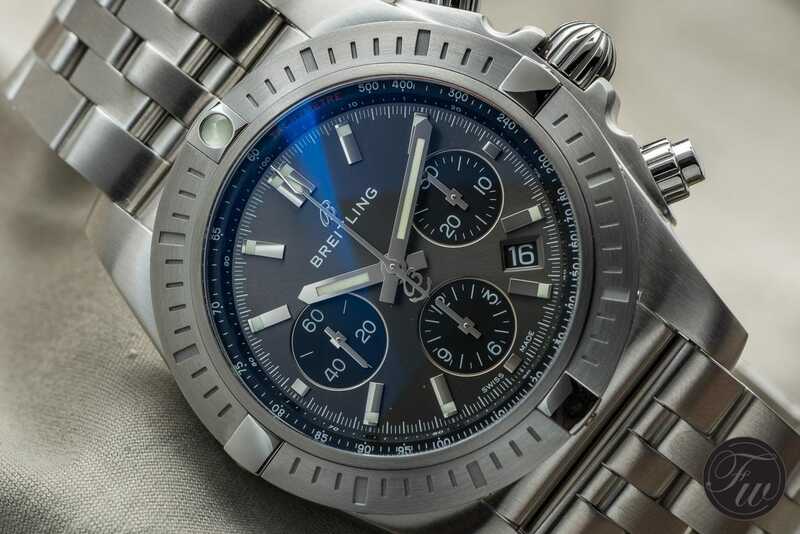 A pity, because this movement is so much raved about (also by Breitling, calling it the best mechanical chronograph movement in the world in their advertising), and now we can’t see it. But we know it is there and we also know that it has a pretty good track record in the meanwhile. 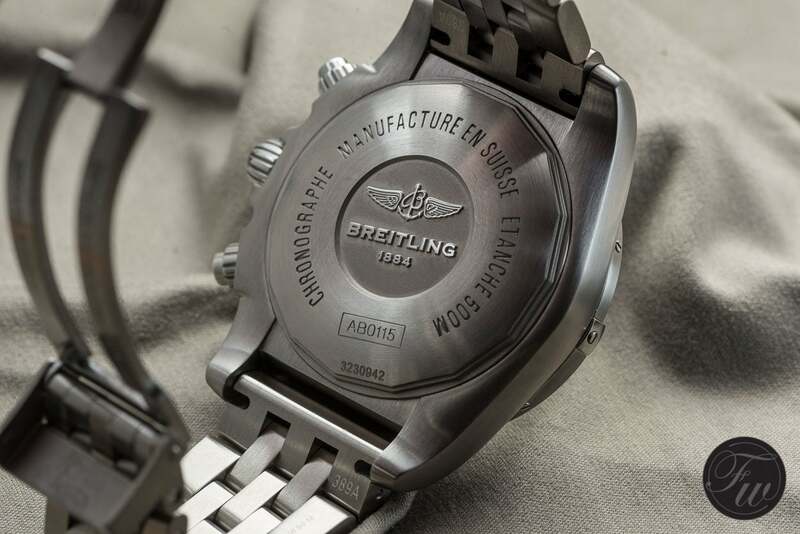 Instead, we find a closed caseback with the Breitling logo and wording in bas-relief and with the typical engraving around it. The B01 movement is a column-wheel chronograph movement with a power reserve of 70 hours. It ticks with 28.800 vibrations per hour and has been chronometer certified. 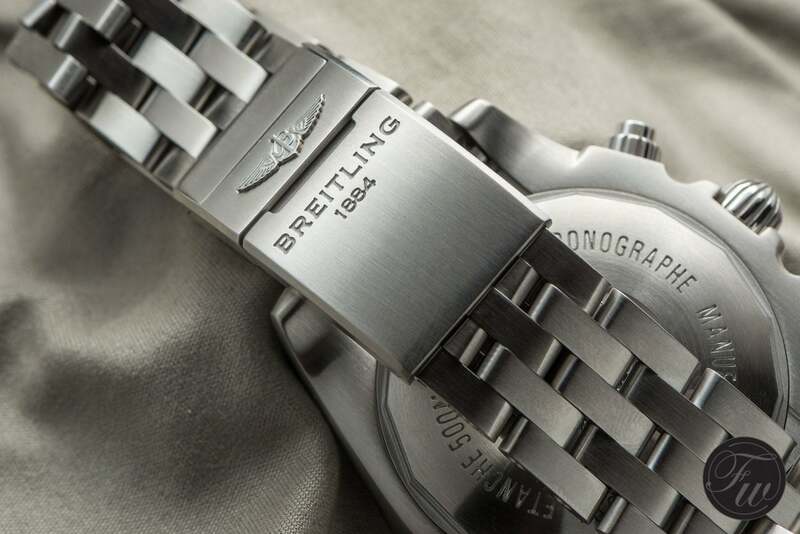 Breitling is positioned 3rd when it comes to brands who certify their movements as a chronometer. This means that on a daily average, it has a maximum deviation of -4 and +6 seconds. That’s pretty accurate. Besides being a column-wheel chronograph, the watch also has the date feature as mentioned above already. This movement was considered so good by Tudor, that they decided to use it for some of their chronographs as well and dub it calibre MT5813. The photo above also shows how solid the stainless steel case actually is. Look at that steel between the lugs, it shows that this watch is not a typical round case and adds to the weight of course. Also available on an alligator strap with tang buckle (saves you 550 Euro), but I prefer the stainless steel bracelet this watch comes on. I am uncertain when Breitling started to use this style bracelet, but to me, it is the bracelet to have for this watch. An older 1980s Chronomat might do nicely on a Rouleaux bracelet (remember Seinfeld wearing them? ), but a modern Chronomat is perfect on this heavy duty Pilot bracelet. The clasp has a flip-lock, to ensure it will sit tight on your wrist. The Pilot bracelet on the Breitling Chronomat B01 Chronograph 44 has a beautiful matte finish, as you can see in the photograph below. This watch is not for the faint-hearted with its 44m x 16.95mm case but due to the matte finish and grey (and black) dial, it is still relatively stealthy. Buy one of the bi-colour versions and it will be an entirely different story. For appearance that is, as the specifications of the movement etc. remain the same. I actually never owned a Breitling other than a Navitimer and a Chronomat was never on my want-list either, to be honest. That might have to do with the shiny examples I have been confronted with in the 1990s and early 2000s. Now, I can see the fun in owning a 1980s Chronomat with Rouleaux bracelet (preferably in bi-colour), but that would be just a fun watch and certainly not an everyday watch. This Breitling Chronomat B01 Chronograph 44 is a well built and finished watch that surely is heavy and very present on the wrist, it still has that level of ‘stealth’ due to the matte finishing on the case and Pilot bracelet. If you love the design, and 44mm is no issue for you, it is a great piece with a very nice column-wheel chronograph movement. The versatility of the watch is limited, it is a very sporty watch but with an alligator or calf strap attached to it, you can make it more colourful or simply ‘lighter’ if you want to. The Breitling Chronomat B01 Chronograph 44 is a no-nonsense watch, does what it promises and will definitely out-live you. So if you are drawn by its looks, and the price is in your budget, you will have yourself a great companion for life. Starting at 7600 Euro for the watch on a leather strap with tang buckle, 8150 Euro for the version we have here. The reference number of the Breitling Chronomat B01 Chronograph is AB0115101F1A1 and you can find it on the official Breitling website.